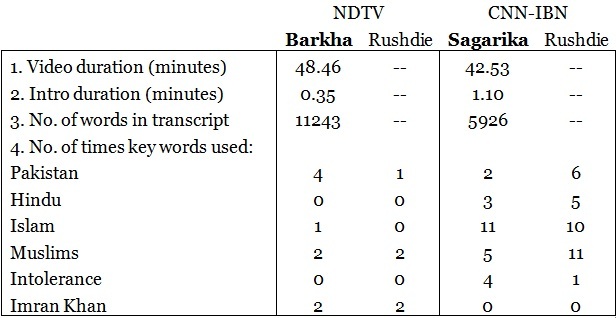 MediaCrooks: Rushdie Interview - Barkha V Sagarika: Who Won? Talk about a collision, like a Salman Khan and Aamir Khan movie releasing on the same day. Won’t happen anytime soon! So let’s make do with a smaller version: The Salman Rushdie interviews by Barkha Dutt and Sagarika Ghose. Both aired at the same slot of 10pm on Monday, September 17. I’m sure both NDTV and CNN-IBN will compare notes on TRP ratings by TAM soon. BD and SG must be the only two media celebs in the world who rushed to London to interview Rushdie over his latest book ‘Joseph Anton’. That’s the name he seems to have used while on the run from the Fatwa and it’s his memoirs. The book is about his life, the Fatwa, life in hiding, free speech etc. from what I gather. I’m not a literary type so won’t make any comments on Rushdie’s writings. (Umm .. it’s actually because I haven’t read any of his work). So some people must have had a little problem on which interview to watch. What if there were an actual direct debate between BD and SG over Rushdie’s new book? Wouldn’t that be a good fight? Both are from St. Stephens, both PGs from foreign universities. Who would win? Comparisons are fun. I always wanted to compare the original ‘Sholay’ with RGV’s ‘Sholay’ and will do that as soon as RGV’s version releases. But in the meantime let’s find out which interview was better; Barkha’s or Sagarika’s. Who won? Want a quick opinion? Well, I don’t have one. So we must measure both on on multiple points. Both had rushed to interview Rushdie for the 96th time but considering this was over his new book let’s see how well they have stuck to the topic and overall presentation. What we'll do is take different segments and parts of the interviews and their presentation and score them. Of course, relevance of the interview to the topic, which is supposedly over Rushdie’s new book will count. Round 1: Screen aesthetics – NDTV shows a much clearer visual while CNN-IBN frequently clutters its screen. The annoyance to the viewer cannot be underestimated. NDTV: Full transcript: NDTV’s Exclusive interview with Salman Rushdie. Even though NDTV’s headline is quite ordinary and the interview not really exclusive it does not misrepresent. CNN-IBN on the other hand makes it a communal match between Hindus & Muslims which was hardly relevant to ‘Joseph Anton’ which was the primary reason for the interview. In fact Sagarika twists a Rushdie statement to create a sensational headline from her imagination. Score: Barkha-1, Sagarika-0. Cumulative: Barkha-2, Sagarika-0. NDTV opens with Barkha’s introduction from the streets of London where the interview took place and gives a glimpse of the place. CNN-IBN opens with scenes of violence, explosion, and flames as if the chat was about a disastrous communal battle. The scenes were not relevant. Score: Barkha-1, Sagarika-0. Cumulative: Barkha-3, Sagarika-0. Score: Barkha-2, Sagarika-2. Cumulative: Barkha-5, Sagarika-2. There are ground rules about a speech or a presentation: Avoid distractions. I could not find Sagarika with any distractive element. She was attired for the occasion and the weather. On the other hand Barkha after her opening sequence had a large distraction. See the two pics and spot the difference. Her right hand fingers are bare in the left pic while on the right she sports a huge ring which frequently comes up on the screen with distractive hand movements. (If she wanted to draw attention to her prized ring, she succeeded). These things focus attention on things other than the topic at hand. If you want to draw attention to yourself or your jewellery then it's not a good idea to conduct one on one interviews or even debates. Round 5 Score: Barkha-0, Sagarika-1. 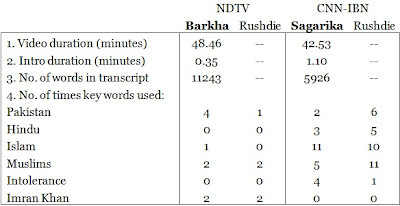 Cumulative: Barkha – 5, Sagarika – 3. Overall Barkha did keep the interview largely to the topic, that of Salman Rushdie's book, his life, his troubles and his future. Sagarika on the other hand was pushing her silly agenda of Hindu V Muslims and balancing intolerance, which was not the main topic of the interview. So there you go. 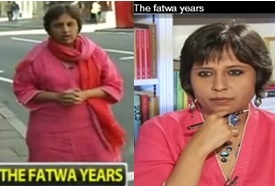 Barkha won the battle 5-3. While this is no professional rating system or game it can surely provide an indicator to the channels on how they are conducting interviews and how they are covering topics. TAM’s TRPs won’t do a similar measurement. Whether discussions are being kept relevant to the topic of the program or some hidden agenda is being secretly followed becomes evident by the questions, by references, by introductory images and even by headlines. By those parameters CNN-IBN didn’t do all that well. Read the post “Balancing mindless violence” which is what Sagarika wanted to do. Barkha would do well to avoid bringing up Imran Khan everywhere. Rushdie’s answer to Barkha when she brought up Imran Khan was pretty dismissive: “Not again, please”. Viewers too can evaluate programs for their own understanding with their own measuring sticks. Correction: In Round 4 the 'Intro time' got reversed. It's Barkha-1.10 & Sagarika 0.35. Typo is regretted. edit..it should be Rushdie uncensored: Hindu intolerance as bad as Muslims'....Thanks for the 'almost' daily posts..
A top of the shelf post. While I can guess that you would have wished & wanted to give them both a "blob" having been a avid follower of your blog and yourself on Twitter you just took up the subject under the microscope and stayed on it and on it alone. Well done. 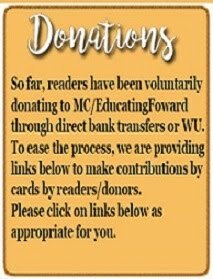 Hope to see more and more off such posts in future and wish that other magazines like "society" come forward and take your writing to others too. BTW, why is Rushdie so relevant in the present climate..
Mrs Ghose' argument would be that 'Hindu Violence' is more relevant to India and hence requires mentioning. How do one judge the differnece or draw a line between media activism and journalism ? Question back to Mrs Ghose would be - when have Hindus, Sikhs, Jains ever burnt police vehicles, attacked police, killed people, attacked embassies to register their protest against a book, movie etc which hurt their sentiments? Her balancing act is misguided, and hurts society at large as it obfuscates a very serious problem of Islamic radicalism which threatens not just India, but whole world. Unless we call a spade a spade, we will never begin to solve this issue. @Vikram - She wouldnt listen , would she :) ? Now , we both will agree its misguided, but how will someone get this into these people's head? Unless , of course, NDA gets into power in next election and BJP decides and builds an Indian version of fox news here ( going overboard by comparing Republicans with BJP - but you get the idea). I'd really like to see what these 'social geniuses' will say THEN. Whether such a scenario is even more damaging, is anybody's guess. I am also off the topic regarding this post .. But could not resist ..who won on last night debate when both Rajdeep and Sagarika were on the same debate questioning Amit Mitra of TMC after Mamta exit from UPA .. it was worth seeing how she was pouncing and was also quizzing Mitra with obvious discomfort and anger that now paymasters decline has started ..
That was brilliant when Ghose asked, "Do you consider yourself a South Asian Muslim"
Salman relied, "No, I am an Indian, who is born in a Muslim family". Not concern about Muslim or not; but this "South Asian" hang of lefties is very well shown its place. Great improvement in Ms Ghosh's capability, now she has jumped to the second position (there were only two participants), it is foolish to expect from her anything other than - Hindu extremism, Muslims,secular,'but what about Gujarat','BJP is equally responsible for the mess','it happened during NDA's rule also' etc. etc.. As far as the winner of match i.e. Ms Dutt is concerned -from Gandhi family she has shifted her focus on Imran Khan and Nitish Kumar ( by the way every week or fortnight in the evening on Aaj Tak and Star news we find a news report/debate on the following topic-'Nitish ke sushashan ki pol khuli' and 'Nitish banaam Modi' with Sanjay Jha/Shakil Ahmed as participants). This article should be an example for people on now to write a critic! Focussed with key data points! As always your keen observation for details is amazing! @Ravinar, can't imagine your detailing and deep inspection. Kudos...i am sure this will be beginning of MSM's self review and focus on key issues with right motives. Very much to the point, great analysis. I wish MFH had met these ladies before he painted Saraswati. she must be having this article where she scored over sagaraika and must hv shed a few tears to know MC thought she was better than SG... validation !! It would be great if you could do one day's analysis of the tweets of India's 3 worst journalists!!! Good post. 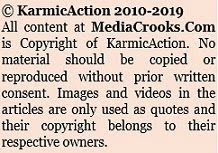 Infact, I have had plans of creating such a site for a while, where the objectivity of a media outlet can be decided by stats as far as possible, rather than subjective assessments. Need some good tech guys!